the health specialists at UCLA. Every adult past the age of 60 deserves to know how to age without aching. You have a right to know what you can do in just six minutes that rewards you with a sharper memory. You should be told which are the four supplements every older adult really needs, according to the nation’s leading nutritionists. Healthy Years wants you to have every new bit of information available to protect your health and keep you happy from here on in. That’s why we have this special offer for you. Give Healthy Years a try with a full, money-back guarantee that you’ll be completely satisfied with your purchase. The right dose of daily aspirin – enough to protect your heart without causing unnecessary gastrointestinal damage. Steps you can take to ensure safer cosmetic surgery. Certain health conditions raise the risk for older people, and it’s important to know about them before you have work done. What you can, and can’t, expect from arthroscopic surgery for arthritis of the knee. Plus an alternative that brings quick relief and can last 20 years. Who may be a good candidate for a successful dental implant. The all-star juice that’s richer in antioxidants than ANY other fruit or vegetable juice. And no, it’s not the much-ballyhooed pomegranate! And did you realize that getting enough vitamin D can cut your risk of colorectal cancer in half? We showed Healthy Years readers how to get what our bodies need – a challenge when the ability to convert sunlight into vitamin D is just 25% of what it was in our youth. In Healthy Years you'll get the latest health research and breakthroughs that will add meaningful years to your life! Which supplements have been shown to slow hearing loss. How to support your immune system and treat macular degeneration without triggering urinary problems, a side effect of zinc. A new, better kind of prostate screening that could lead to earlier detection and fewer false positives than the widely-used PSA test. How to protect your bones and reduce your risk of fractures if you have inflammatory bowel disease. Certain osteoporosis drugs (including Fosamax and Boniva) can make inflammatory bowel disease symptoms worse. Why curcumin, the spice found in curry, has caught the attention of researchers at UCLA’s Alzheimer’s Disease Research Center. Important breakthroughs and research findings like these are the reason the UCLA Department of Geriatrics started publishing Healthy Years for active adults. And it’s why we’re so confident in our invitation to you for a risk-free subscription. Age-targeted tools you can act on today.Consider the fact that on this page alone, you will find dozens of age-targeted tools you can use to build and maintain better health. Now just imagine what you will learn when you receive your first issue, and the next issue, and the next! 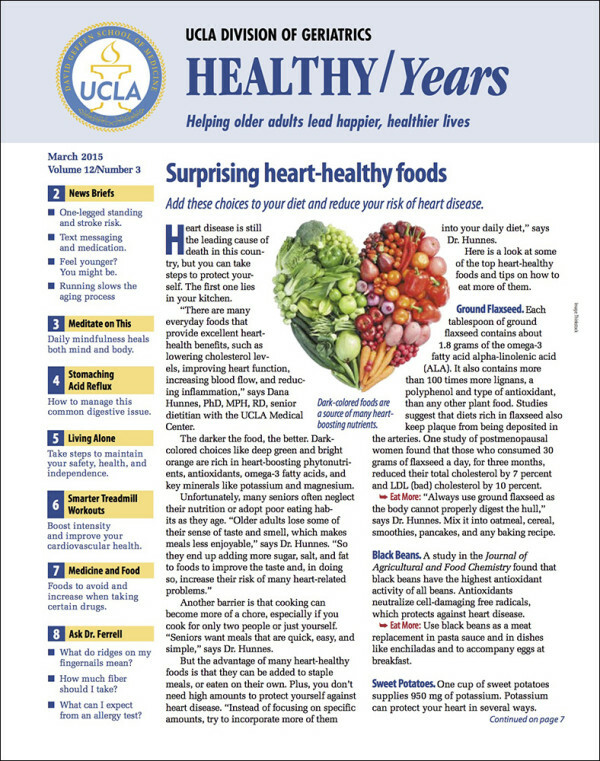 Healthy Years is laced with “What You Can Do” boxes that translate health news into an action plan for you. A recent feature on newly-identified biomarkers for diabetes included two promising new tests to discuss with your doctor to see if they are appropriate for you. Learn why many doctors resist prescribing the most effective drug to relieve severe pain for their older patients, and what to ask for so you’re not shortchanged of this option. Specific steps you can take if heartburn is your constant partner. What you can do right now, if you’re diabetic, to lower your chances of serious vision problems later on. And how to avoid the decline in mental function that affects some older adults after general anesthesia, and can last as long as two years. Healthy Years gave readers a pre-surgery “to do” list to lower the risk. Certain migraine drugs aren’t a good idea for people 60 or over. Healthy Years readers learned a safer way to block crippling headaches without harming your heart. What steps you can take to remain a safe driver and hold onto your driver’s license – and your independence – a lot longer. Taking along a passenger can provide you with a navigator, an extra set of eyes on potential traffic problems, and help in case of a medical emergency. A 70-year-old brain isn’t as active as a 7-month-old’s so it’s up to us to stimulate our brains and keep the neural connections alive. Word games and math games are fun and good for your brain, too, according to UCLA neurologist Gary Small, MD. Healthy Years helps put the healing power in your hands where it belongs. You’ll discover which foods are your true allies during the middle years, and beyond. How to exercise in a way that respects and protects your joints and muscles. What questions to ask your doctors to be sure you’re getting the latest and most effective treatment available. Trustworthy, authoritative answers to your questions.The more informed you stay about new options and alternatives, the better you’ll enjoy what UCLA doctors view as your prime. Healthy Years answers your questions large and small, privately and in plain English. Healthy Years is your guide to interpreting what you hear in the news or see on TV. Do those nasal strips and over-the-counter sprays that claim to reduce snoring really work? Will seasonal allergy sufferers benefit from a new vaccine that controls symptoms with just once-a-year-treatment? If you hate taking those huge calcium supplements, can you prevent osteoporosis by chewing Rolaids or Tums? Why UCLA? Why now? And why you?For more than 40 years, UCLA Medical Center has been a leader in patient care, medical education and scientific research. We rank at the top of the list of hospitals in U.S. News & World Report’s annual survey of America’s Best Hospitals. Each year, hundreds of thousands of people from across the country and around the world travel to UCLA to receive compassionate care based on the latest medical knowledge. Healthy Years extends our healing mission to intelligent, concerned individuals like you, right in the comfort of your own home. Straight from the source at the world-renowned UCLA Medical Center, we recently told readers . . .
What a UCLA physical therapist’s patients do to strengthen their muscles before an operation so they bounce back faster after surgery. A UCLA specialist’s view on using testosterone injections to help a man over 65 retain his coordination and balance. Whether you can safely indulge in fatty steaks and sour cream once you’ve reached your 80s, according to a UCLA specialist on using diet to prolong life. It seems that every week, important new breakthroughs are made that can positively impact your life. With nothing to lose from this risk-free offer and good health to gain, starting a subscription to Healthy Years is a no brainer! Click here to begin receiving Healthy Years. If, during your subscription, you are ever dissatisfied with Healthy Years for any reason, call, write or email us and let us know. We’ll immediately return you your money, no questions asked. Wouldn’t it be great to sail through these years with your health and independence intact? Start your subscription today and start making it happen.